Kristen joined Babcox Media in 2013 as a member of Tire Review. She currently serves as editor for Shop Owner, Servicio Automotriz and TelematicsTalk.com. The 2009 graduate of the E.W. 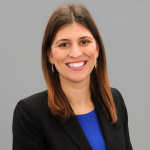 Scripps School of Journalism at Ohio University, brings a wealth of experience from assignments as digital media specialist at Little Rock Air Force Base, publicist at Vance Air Force Base and stints as a contributing writer with both the Toledo Free Press and Southeast Ohio Magazine. How Are You Helping Your Customer? Purchasing your first car is a milestone. For Bill Nalu, his experience was full of lessons that would shape his career. He learned about listening to advice, the consequences of actions, and eventually, auto repair. When it came time to purchase his first vehicle, Bill and his father went to a local used car dealer. Like most 16 year olds, Bill thought he knew best and he ignored the advice of his father. After only a day of looking, Bill financed and put down a $500 deposit for a two-door Ford Pinto. Two miles from his house, the car broke down and it had to be towed. It took Bill eight months to pay his father back for towing. And, since he didn’t have money to fix the Pinto, Bill signed up for auto repair in high school so he could work on his own car. “When my car broke down, I had to take auto mechanics. Because of that experience, it opened me up to a completely different world; one that I wasn’t really aware of,” Bill shares. Bill continued to work on his own cars throughout college, investing in cars, repairing them, and selling them for a profit. While he never worked as a technician, eventually Bill turned a love of tinkering into a career as an automotive repair shop owner. 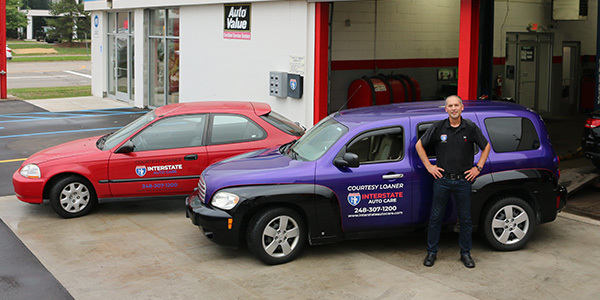 Today, Bill owns and operates Interstate Auto Care in Madison Heights, Michigan. 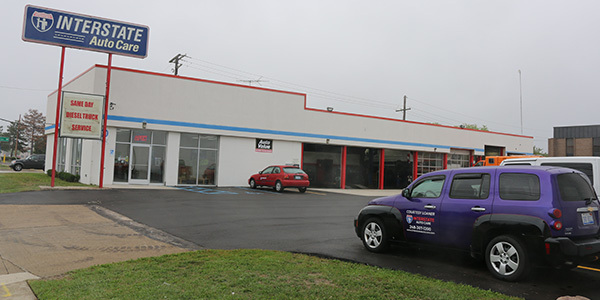 Hours of Operation: Monday – Friday 7 a.m. to 6 p.m., Saturday 8 a.m. to 5 p.m.
An Auto Value Certified Service Center, the shop prides itself on taking care of customers. Based on its 4.7-star Google Review rating, Interstate Auto is quite successful at meeting its customers’ needs. Interstate Auto strives to serve its customers with “aggressive hospitality,” Bill says. 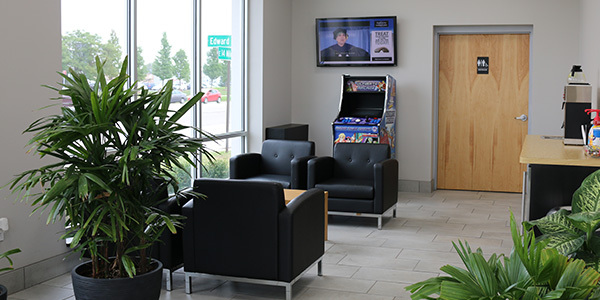 Interstate Auto recently renovated its waiting area to be a more open and inviting atmosphere. The waiting room offers complimentary beverages, reading material and a vintage arcade game for customers to play. The shop also has free Wi-Fi and offers customers a charging station for their phones. 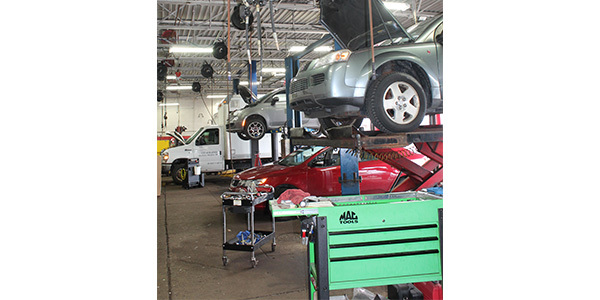 If customers don’t want to wait for their vehicle to be repaired, the shop offers shuttle service and has a fleet of loaner cars available for longer repair jobs. Offering loaner cars is just one of the many ways Interstate Auto tries to make things convenient for customers. The shop often goes out of its way to make things easier for customers. “We’re facilitators of auto repair and much more,” Bill shares. Interstate Auto has gone as far as helping its customers purchase used cars when a car is beyond repair, or teaching their customers’ children how to purchase a vehicle. When Bill purchased his first car, he learned his actions have consequences and you should listen to advice when it’s given. Bill uses this experience daily in his business and when dealing with customers. “When we make decisions and it doesn’t work out, one’s mindset should not be ‘Oh, my stupid luck.’ Instead, it has to be, what can I learn from this? What is that message?” he says. Bill — who manages Interstate Auto’s online presence himself, often responding to reviews — notes customers are talking about their disgruntled experience online, which is after the fact. He advises shops to be proactive and address issues at the counter. Bill says that customer criticism — even constructive criticism — maybe tough to hear, but can be valuable to the shop. “You might be more apt to listen to advice when it’s coming for you, not at you. It sounds like it’s coming at you, but it’s really coming for you,” he says. By asking customers what they need and want from a shop, Bill has been able to develop new services and offerings for his customers. Since Interstate Auto Care is located in metro Detroit, the traffic can make it difficult for customers to pick up their car during business hours. 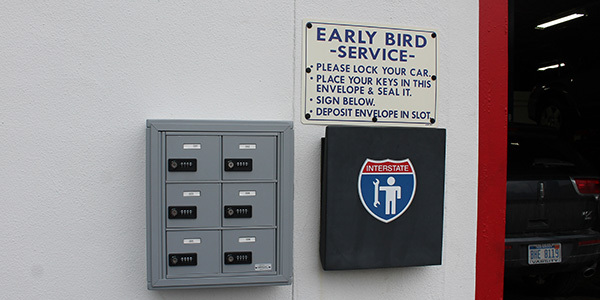 Customers kept sharing these challenges with Interstate Auto Care, so to help make things more convenient for them, the shop offers online payment methods and a lock box for keys outside so they can pick up their vehicle after hours. “Now, the spouse picks them up from work and they go to dinner. Then, they come by at 9 p.m. when I-75 isn’t wall to wall with cars and it’s convenient. More importantly, they understand that this particular service provider is always thinking about the differential value that they’re offering,” Bill shares. Since so much of Interstate Auto’s business is built on customer relationships, the shop relies heavily on word-of mouth and customer referrals. The shop doesn’t utilize traditional advertising or customer reminder cards. However, Interstate Auto is a RepairPal Certified shop and member of Costco’s auto referral program, and attributes a portion of its business to those programs. Interstate Auto Care specializes in general automotive repair, offering repairs on both import and domestic vehicles, as well as some medium-duty trucks. While many shops focus on car count to generate profit, Interstate Auto focuses on taking car of the customer’s needs. “One misnomer is that you need a higher car count in order to generate a profit. I don’t believe in that. I don’t think you need to speed up the assembly line. Instead, I think you should slow down the assembly line and make the product more valuable to the consumer,” Bill says. 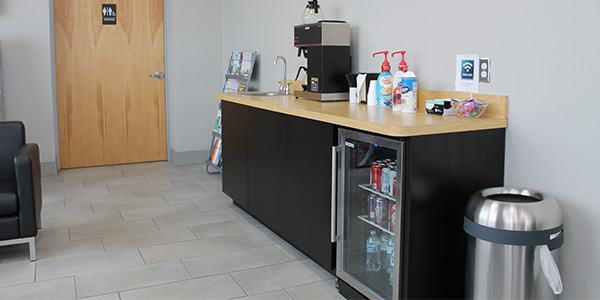 Interstate Auto Care aims to provide value to customers throughout their entire interaction with the shop. 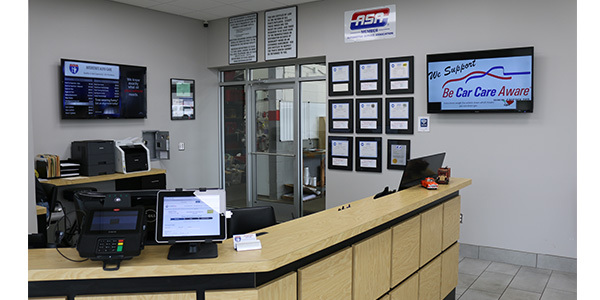 In addition to its “differential” offerings – convenient online paying, after-hour pickup and loaner cars — the staff focuses on educating the customer about their repairs. The shop has a video monitor displaying different maintenance tips, to help educate the customer before repairs become an issue. Once a vehicle is in the bay, Interstate Auto Care sends its customers texts and emails, that include photos to provide a repair visual and educate them about any necessary repairs. Every car that comes into the bay is inspected for safety, as well. Sometimes these inspections uncover unexpected issues for customers, so Interstate Auto Care also offers customers an option for financing, if they’re worried about the cost of a repair. 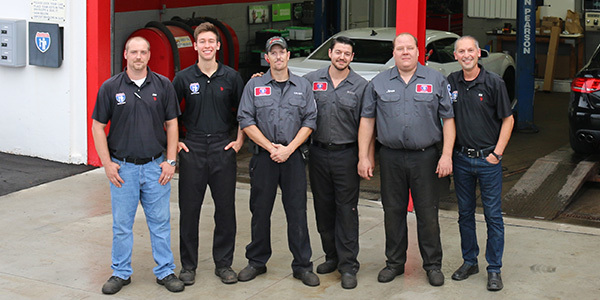 Interstate Auto Care’s team has been working together more than 10 years. From left to right: Manager Joe Lerchenfeld, Assistant Manager Nick Nalu, Shop Foreman Casey O’Sullivan, Heavy Tech Mark Adams, Lead Tech Norm Schultz and Owner Bill Nalu. Since vehicles today are getting more and more complex, Bill emphasizes the importance of staying up-to-date with technology. Interstate Auto Care regularly participates in training through Auto-Ware’s Tech Expo and the AAPEX Show. To address the needs of servicing today’s vehicles, Interstate Auto Care employs three ASE-certified technicians. Additionally, the company employs a long-time service writer, plus Bill, to oversee the business side of the shop. Bill’s son is also in part-time training at the shop. All of Interstate Auto Care’s employees have been with the company 10 years or more, and Bill attributes his longevity to God’s grace. “These guys should have fired me two dozen times over the years, and I should have fired them 20 times. But, this hasn’t happened because we have a tight-knit group; because we’ve proven to each other that when one of is down we pick the other one up. Culture is a hugely important part of our team’s success,” Bill says. Bill is hoping to add another technician to his team, once he finds the right fit. In the future, the makeup of Interstate Auto Care may look slightly different, as Bill hopes to bring some of his employees in as co-owners of the location. “In three to five years, I want to bring in the guys who have helped me bring [the shop] to where it’s at, and say we are going to be partners,” he shares. But, one thing that won’t change is the shop’s dedication to its customers.